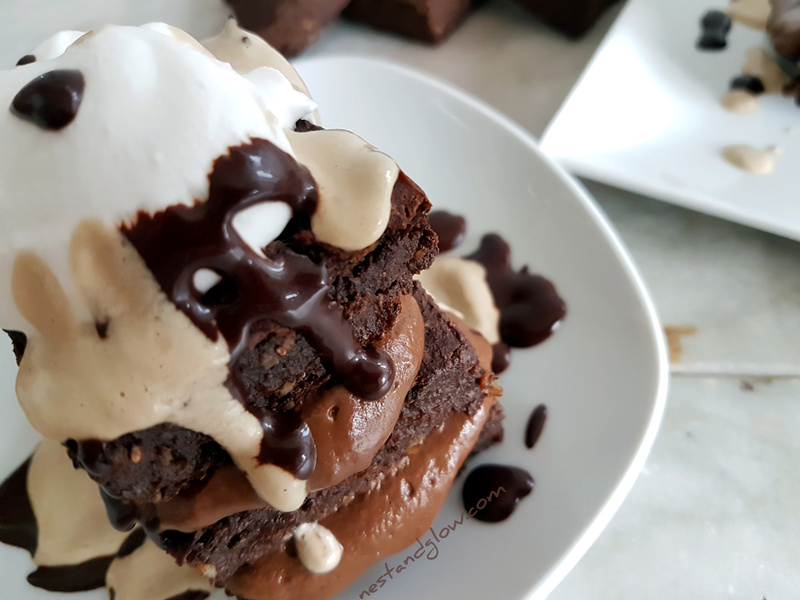 Healthy chocolate vegan brownies with sweet potato, avocado frosting, coconut whipped cream and sunflower seed caramel are what I confidently call the ultimate healthy chocolate fudge brownie. No flour, no butter, no eggs, no milk, no gluten, no grains, no nuts and no oil! This healthy brownie doesn’t just look good and provide nutrition it also tastes great and is easy to make. 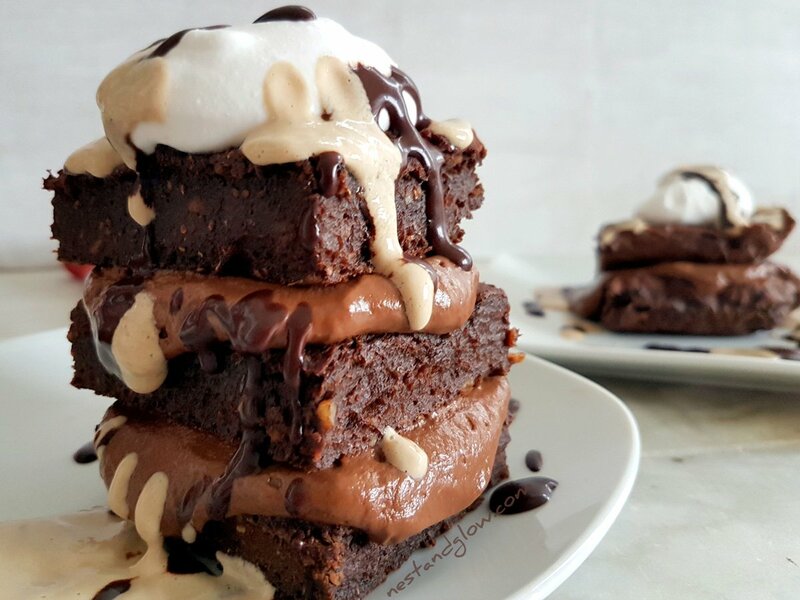 The brownies are nice on their own but with a chocolate avocado frosting, sunflower caramel, coconut whipped cream and chocolate sauce they are elevated to the ultimate healthy chocolate brownie. These brownies are vegan, paleo, refined sugar-free, gluten-free, plant-based, nut free, grain free and oil free. That is a long list of diets but the main point is they are bursting with nutrition and are delicious. It may look like a lot of ingredients but all the toppings are a case of just mixing or blending and you don’t have to use all four – just one or two are more than enough! There are lots of sweet potato brownies out there but I have experimented to make one that is vegan, grain free, gluten free, nut free and full of nutrition from sunflower, chia, dates and buckwheat. Buckwheat despite the confusing name is actually a gluten-free seed and nothing to do with wheat. It’s one of my staples on a healthy diet as it’s cheap, nutritious and very versatile. One of my best recipes is for buckwheat bread that is naturally gluten-free. Buckwheat is often known as pseudocereal as it is used as a cereal or grain but isn’t one. You can taste the brownie batter before you bake to check the sweetness – all the ingredients are safe to eat raw. If you wanted to have iced healthy brownies but are short of time just save one-third of the brownie batter mixture and blend it with a bit of water to make the frosting. I thought about making the recipe just like this but this recipe to be popular the photos will need to have silky smooth icing and while using the mixture would still look good it will be as aesthetic. Feel free to replace the liquid sweetener with more dates. I use just normal pitted dates in this healthy brownie recipe. Medjool would probably work really well to make these even fudgier, but they are expensive. It’s best to chill your coconut milk and avocados overnight if you have a warm house. This helps to make them firm. As I live in a cold house just in my cupboards was easily enough to make a thick whipped coconut cream. Only chill your avocados for the chocolate avocado frosting once they are perfectly ripe. Sunflower seeds are soaked in this healthy brownie recipe to make them easier for the body to digest. Soaking the seeds starts the germination process. This deactivates the enzymes in the seeds, also present in nuts. The enzymes present so that seeds can pass through the digestive tract unharmed and be dispersed. You can grind up buckwheat yourself to make buckwheat flour. If you don’t have any buckwheat then you can replace with ground oats. You can use milled chia seeds if you prefer – I like the crispy texture of the little whole chia seeds in these brownies. Or flaxseeds work well as a direct replacement in this healthy brownie. To make this brownie more indulgent add some coconut or butter oil to the brownie mixture – it will smell divine when baking. I’ve got a recipe for coconut butter that can be made from just pure coconut. If you want a spicy kick then add 1-2 tsp of cayenne pepper. It gives it a deeper flavour that complements the robust chocolate flavour. I usually add cinnamon or cayenne but not both as can be overpowering. Chocolate and chilli pair very well together and the Aztecs often enjoyed both together. This because chilli peppers contain capsaicin that releases endorphins and chocolate releases serotonin, the happy brain chemical. This combination together produces what is described as an extreme aphrodisiacal effect by the World of Chillies. Don’t bin the sweet potato skins, instead bake them at low temp for a crispy delicious chefs treat! The skins of sweet potatoes are very nutritious. I always bake sweet potatoes whole as its quick, makes cooked sweet potato full of flavour and it’s easy to scoop out the orange flesh and enjoy the skins. Pre-heat oven to 180 C / 350 F.
Bake the sweet potatoes for about half an hour until soft. Allow to cool then peel away the skin so you are left with just the flesh. Soak the chia seeds in 9 tbsp of water. Soak the sunflower seeds for at least 10 mins then rinse and drain. Place all of the brownie ingredients into a food processor for 2-3 mins until broken up. Pour the healthy chocolate brownie mixture into a tin lined with greaseproof paper. Use a large tin about 10″ by 6″, any will do but you may need to adjust the cooking times. Bake at 180 C / 350 F for 30-35 mins until when you stick in a fork it comes out clean. Leave to cool and firm up for 15 mins before taking out of the pan. Blend all the avocado frosting ingredients together, you may need to add a few tbsp of water. Whip the coconut milk for a minute to make the coconut whipped cream. Blend all the sunflower caramel ingredients together to make this nut free caramel sauce. Layer up the ultimate healthy chocolate brownie – brownie layer followed by avocado frosting, repeat this twice then top with coconut whipped cream and drizzle with chocolate sauce and sunflower seed caramel. It looks best with three layers of brownies, but it will self-destruct into a delicious mess when you attempt to tackle it! This is amazing – I already have date caramel sauce and coconut whipped cream made in my refrigerator. These might have to happen before I run out! I eat dessert every night but this would almost require a special occasion to eat it just LOOKS like such a treat. Any alternative for the sunflower seeds in the brownie mixture? I bought the sunflower seeds to try this but i couldn’t get buckwheat…how much oat flour should i substitute it with? Hi is it possible to use prunes instead of dates? Sure! I would use the drier prunes rather than the wet ones but honestly, the fruit is just there for sweetness. You may want to test it to check you’ve got the right sweetness for your tastes – it’s hard to say the right amount to use as there’s so much natural variation. This looks so good! What kind of food processor do you use? It works so good and I need a new one!! I’ve got a ninja kitchen system at the moment, although I have broken the lid so need to hold it down at the moment. It’s good but i think it maybe trys to do too much. I really want to buy a magimix as hopefully that will last a long time, although I’ve been saying that since I moved house 5 years ago! Are there 420 calories in am four brownies or just one? Hi there, it’s per serving so 3 brownies with the fixings. 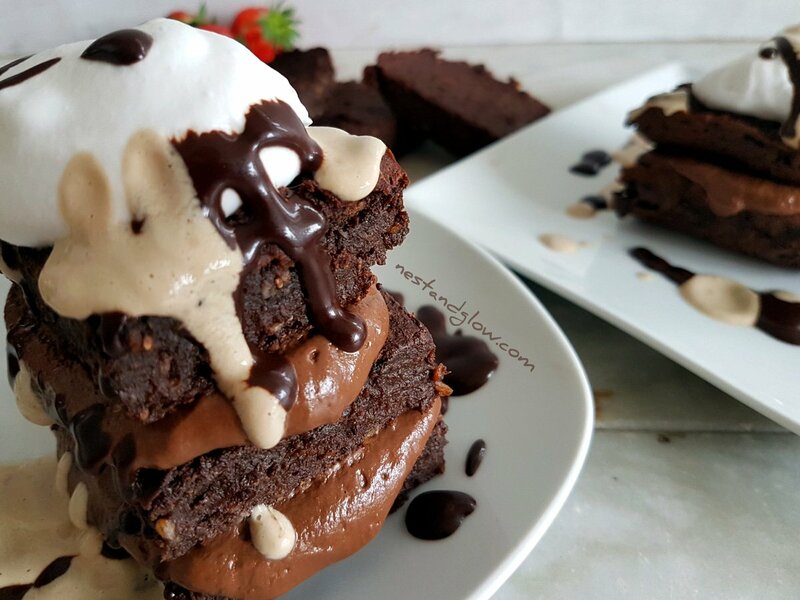 Hope that helps and let me know if you try this healthy chocolate brownie! Hi! I soak and sprout my buckwheat. I am assuming i cannot just mix my sprouted buckwheat with all the other ingredients in food processor? Instead, would i have to dehydrate my sprouts and run through my flour mill? Hoping the first option would work. I usually try to use sprouted and dehydrated in this and do a big batch every month. However I think the first method should work so soak your buckwheat then leave somewhere to drain and dry as much as possible then just use in the recipe. It might take a bit longer to cook but I’m sure it will work just as well. Let me know how you get on. Is the cooking temperature for a regular or fan oven? Hi Janet, its for a regular oven – but it’s just a very rough estimation as the size of the sweet potatoes will determine how long they need to bake more than anything else. For anyone who does use a fan oven. The temperature adjustment is to use 160*c [if a recipe calls for 180*c]. This is more important for cooking the brownies to prevent burning. I’m so sorry I got my recipes mixed up this morning! I thought you were talking about the three ingredient brownies as had a comment before yours about that, in that one it really doesn’t matter as you are just cooking the potatoes before scooping out the flesh. For this recipe it does indeed matter! You are spot on, for a fan assisted do reduce by about 20C. Can I substitute coconut flour with cassava flour? I haven’t tried it, but think it would work well. Yummm!! Would love to eat the whole thing in one sitting but gotta savor! How long will the coconut whip cream and avocado sauce keep in the frigid? Same here! Should be good for 3-5 days, the taste / smell will give away when it’s off. Thanks for sharing this recipe. It came out great but I struggled without a big enough food processor. How many cups in your processor? I am in the market for a new one and hope that I can make this again without having to do the processing in small batches! Hey there, I think mine does about 8 cups. A food processor is good but I find 95% of the time I just use a bullet one. But saying that I do live on my own. I also wonder about using dried cherries instead of dates. What do you think??? That sounds great! I just love dried cherries and chocolate – the tart and sweet flavour is the best!